The first version release of the mass mailer allowing users to send a personalized email. Improved matching to simplify finding the correct candidates for the job. An additional Performance Report to help monitor performance. This optional Premium Service allows you to send personalized emails to multiple leads and candidates from within Tamago-DB. Please contact us to activate this feature for you. The Mass Mailer requires an active email synchronization for the user to send out emails. From the contact grids (Leads, Candidates, Clients, All Contacts), a shortlist or the Advanced search page, when selecting one or more contacts, you can now choose the action 'Email contacts' and 'Email jobs'. The old 'BCC' feature remains available. Upon selecting either 'Email contacts' or 'Email jobs', a modal will pop up allowing you to write a personalized email. The email will be sent to the contact's primary email address when available, if no email address is set as primary, the oldest email address will be used. Inactive email addresses are ignored. The content of the email can be personalized with information from Contacts. Information from the Company and the Job is available when 'Email job' has been chosen. Each candidate's own information will be replaced by the placeholders. Templates (including personalization) can be saved in the User Profile. The template can be appended to the 'Email content' field using the 'Append template' button. The 'Append signature' button allows you to append your signature to the email. The signature can be saved in each user's own settings. Select an existing attachment from the Job record to send as an attachment, and/or select multiple files from your computer to attach to the email. The mass mailer will generate an email, for each recipient, in your actual mailbox (GMail, Outlook, ...). Sending out the emails will be performed by your email provider (GMail, Microsoft Office, ...). The benefit of this approach is having the sent email in your actual mailbox and not limited to only being available in Tamago-DB. Since it's the actual mailbox sending out the emails, the mass mailer will be subject to any limitations set in place by your email provider. For example, GMail has a 24h limit of 2,000 outgoing email messages. Please be aware of any restrictions of your mailbox. The Mass Mailer has been built with sending dozens of email messages in mind, not hundreds. In case a large email campaign is required, contact us. Matching candidates to jobs and jobs to candidates has received an update. In order to retrieve more relevant results, the algorithm has been tweaked. Important fields are boosted, while matching on the description has been made less important. A match on the job title and the candidate's current job position will weigh heavier than a match in the job description vs the candidate's profile. Additional fields have been added : job industry vs candidate's desired industry, job category vs candidate's desired job category. The job/candidate owner and the job status information is now available on the list of matches for each record. In Administration it's now possible to exclude a Tag Group from being used when matching jobs and candidates. 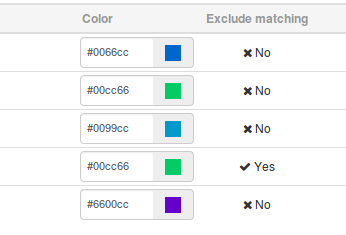 This can be useful when the tags are not relevant for matching and might impact the quality of a match in a negative way. To toggle the exclusion state, click on the Yes/No. The compare screen has also been improved, the tags of both job and candidate will now show. 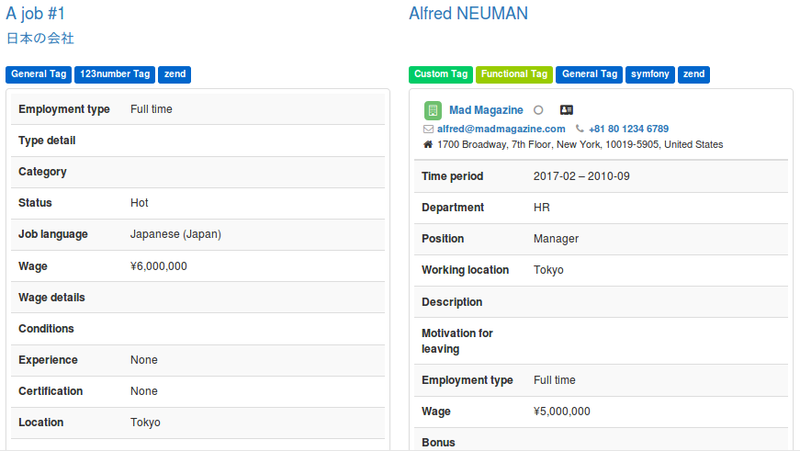 Additionally, the current employment details and the profile of the candidate have been added to make it easier to evaluate the match. An additional reporting screen has been added which gives a better look at the performance of the users. Each number can be clicked and will take you to a filtered grid containing the actual data represented by that number.